Many of us have had experience with a tooth chipping or breaking and you may even find that when this does happen, it may not hurt at all or maybe only slightly. Although you may not feel any pain, your tongue will usually feel a sharp area quite quickly. If you experience a minor tooth fracture, it usually doesn’t cause pain, but if for any reason a large piece of tooth breaks off, it is far more likely to hurt. 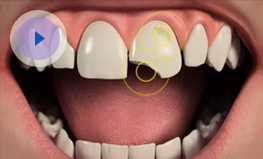 The nerve inside the tooth may be damaged and we will need to examine the tooth. Extreme discomfort also can happen when nerve endings in the dentine are exposed to air, hot or cold foods and drinks. Pain from a broken or cracked tooth may be constant or you may find it is a pain that come and goes but is not there all the time. Many people feel pain when they chew because chewing puts pressure on the tooth. Cracked (fractured) Teeth. You will be unable to treat a cracked tooth at home. You need to see your dentist. Sometimes the tooth looks fine, other times it hurts only when you eat or when the temperature in your mouth changes (because you drank something hot or cold, for example). If your tooth hurts all the time, this can indicate that you may have a damaged nerve or blood vessels. This is a serious warning sign. A way of knowing if you have a cracked tooth is if it does not hurt to bite on the tooth, but pain occurs when you release the bite. If you have an area that is bleeding, apply pressure with a piece of gauze or clean handkerchief to the affected area for about 10 minutes or until you find that the bleeding has stopped. Apply a cold pack to the cheek or lips over the broken tooth. (you can use a pack of frozen peas wrapped in a tea towel)This will help reduce swelling and relieve pain. Take an over-the-counter pain killer if necessary.